Closet Democrat and nonstop Trump basher Beth Fukumoto didn't elect herself GOP minority leader at the State Capitol for the past 2+ years. Just like her predecessor, the party-switcher and Fukumoto buddy Aaron "Ling" Johanson, Fukumoto's colleagues elected her the top leader of elected Republicans in Hawaii. If they had never elevated her to the post of Minority Leader at the State House of Representatives, only her poor constituents in Mililani would probably know who Beth Fukumoto is. But, Fukumoto IS the leader, and was recently RE-ELECTED Minority Leader by her five Republican colleagues -- so we've got a big problem to solve. 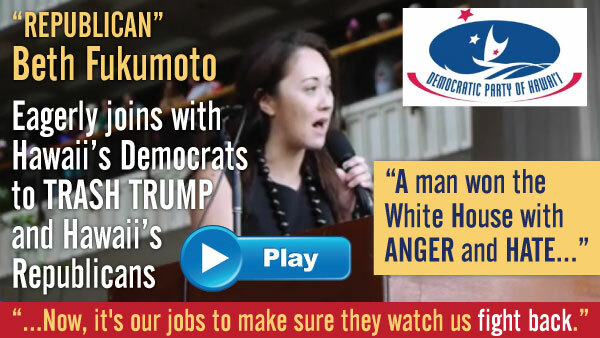 Ever since RINO Fukumoto happily joined with Democrats in trashing local members of the GOP and President Trump one week ago at the Democrat rally down at the State Capitol , have her Republican colleagues publicly called on Fukumoto to step down? NO. Have they called on Fukumoto to apologize? NO. Have they demanded that the RINO's who control the Hawaii GOP either kick Fukumoto off the State Committee or resign themselves? NO again. Is Fukumoto STILL the top leader of Republicans despite threatening to become a Democrat, being booed off the stage at the GOP state convention, and helping Democrats trash Republicans at last week's Democrat rally? YES she is. Unfortunately, like the official silence and neutrality of the RINO-controlled Hawaii GOP, the painful silence of the few remaining elected Republicans in Hawaii is unacceptable in every way. 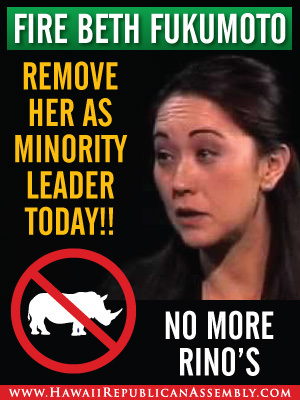 BOTTOM LINE : Beth Fukumoto needs to be FIRED as Minority Leader . She needs to be THROWN OFF the Hawaii GOP's State Committee. And she needs to APOLOGIZE to the each and every member of the Republican Party here in Hawaii. creation and funding of Hawaii's now-defunct Obamacare exchange costing taxpayers $205 million (a unanimous vote of House Republicans while Gene Ward was Minority Leader). IT GETS WORSE: GOP state party chair and leading RINO Fritz Rohlfing and his newly-hired executive director Jack James recently told Duke Aiona's radio audience that Beth Fukumoto has been handed the reins of power by the Hawaii GOP to decide the messaging, policies, and programs for all Republicans in Hawaii. 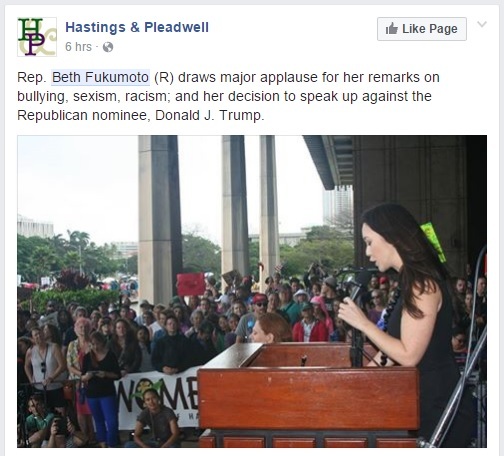 As HIRA recently reported, Rohlfing announced that Beth Fukumoto is the one who decides what it means to be a Republican: "The onus of party messaging is on current GOP office holders in Hawaii. The party is there to support incumbents' policies and programs." And Beth Fukumoto is the top "incumbent" that Rohlfing is referring to as being in charge of the GOP message, policies, and programs. That's how totally screwed we all are to have a closet Democrat in charge of Republicanism in Hawaii, with the full support of RINO party leaders and RINO's at the state legislature. Weak leadership by unprincipled politicians (and equally unprincipled party leaders) is why our state is in so much trouble . Democrats already provide support for the failed policies which cause half of Hawaii residents to struggle from paycheck to paycheck, which make Hawaii a Tax Hell, and which allow Democrats to shamelessly experiment on Hawaii families with progressive social and economic policies that lower our quality of life. Why should any Republicans, let alone our Minority Leader, be helping to make Hawaii worse? Deliberately undermining Hawaii's quality of life with support for failed policies is totally unacceptable coming from local Democrats . And it's even MORE unacceptable coming from local Republican officials. 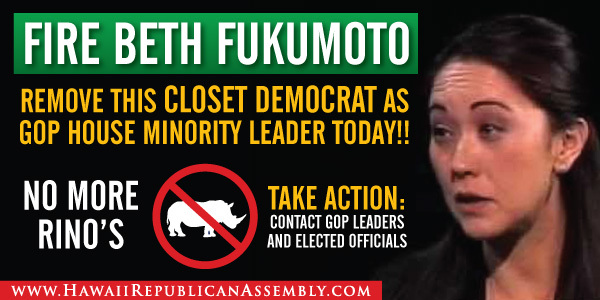 On behalf of real Republicans in Hawaii, HIRA demands that Beth Fukumoto's colleagues immediately terminate Fukumoto's position as Minority Leader. We cannot have the top elected Republican in Hawaii be a known closet Democrat who has made it abundantly clear she would be happier as a member of the Democrat Party, where she can enthusiastically attack Republicans and embrace Democrat policies with her fellow HIRA-hating pal Aaron "Ling" Johanson all day long. Further, HIRA demands that the RINO leadership of the Hawaii GOP immediately throw Fukumoto off the ruling State Committee for violating the rule against that committee's members engating in trashing of fellow Republicans . It's a clear cut rule. Even rank-and-file members are not allowed to give political and financial aid and comfort to Democrats under another longstanding rule about "support" to candidates which oppose Republican ones. An emergency meeting of the State Committee needs to happen immediately to kick Beth Fukumoto off that committee. And while they're at it, it's been nearly one month since the State Committee unanimously agreed to kick Fukumoto's fellow backstabber Kym Pine out of the Republican Party at HIRA's urging for providing financial and political support to multiple Democrats in recent elections . 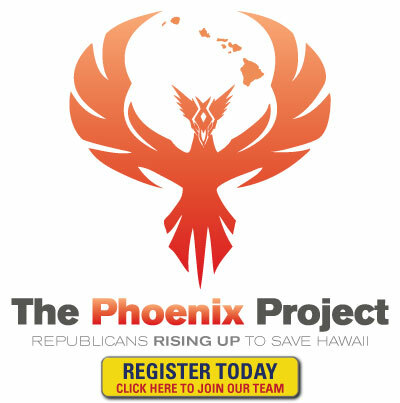 RINO party leaders Miriam Hellreich, Fritz Rohlfing, Gene Ward, and Jack James have refused to announce publicly that tax-hiking PRP puppet Kym Pine is being kicked out of the GOP because Pine might be 'the next Charles Djou'; as in the GOP's best hope for Honolulu Mayor in 2020. 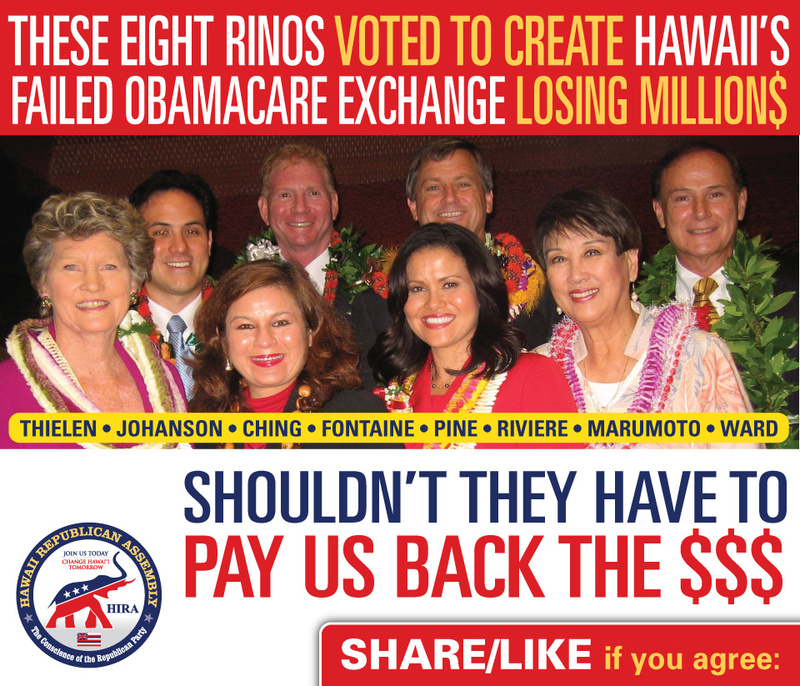 Under existing management, the Hawaii GOP loves RINO's. And Fukumoto and Pine are birds of a feather from that same species. 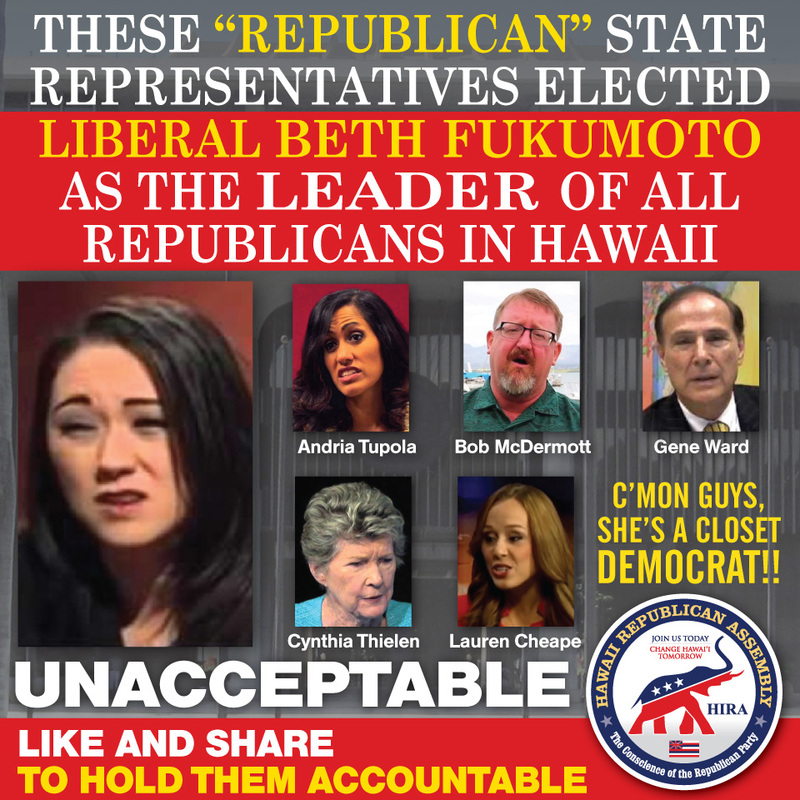 In an upcoming newsletter, HIRA will explain in greater detail WHY your pressure is needed to get GOP legislators and party leaders to do the right thing about mega-traitor and closet Democrat backstabber Beth Fukumoto. In the meantime, contact party leaders and Republicans at the legislature. 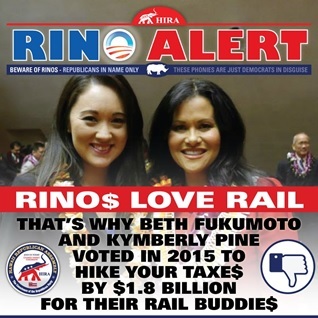 The GOP is dead in the water while RINO Beth Fukumoto remains the face and voice of what it means to be a Republican in Hawaii. Fellow Republicans, if we hope to save our party and save our state, It's time to DRAIN THE SWAMP. HOW INVOLVED WAS BETH FUKUMOTO?? : A Democrat-oriented public relations firm which organized the march relied on RINO Beth Fukumoto to help promote and speak at last week's Democrat march . . . even arranging to get Fukumoto on live morning TV to promote the anti-Trump, anti-GOP protest . 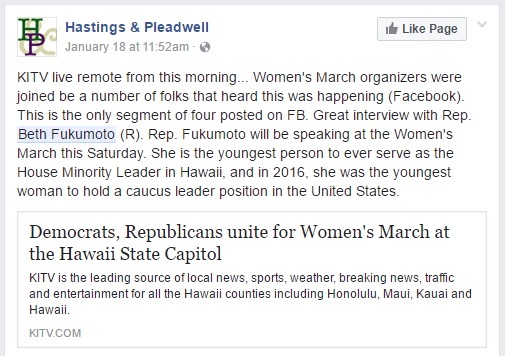 In fact, Fukumoto's active involvement promoting and participating in the Democrats' anti-Trump, anti-GOP event made it possible for the news media to portray the "Women's March" as BIPARTISAN . KITV's actual story headline was "Democrats, Republicans unite for Women's March at the Hawaii State Capitol". 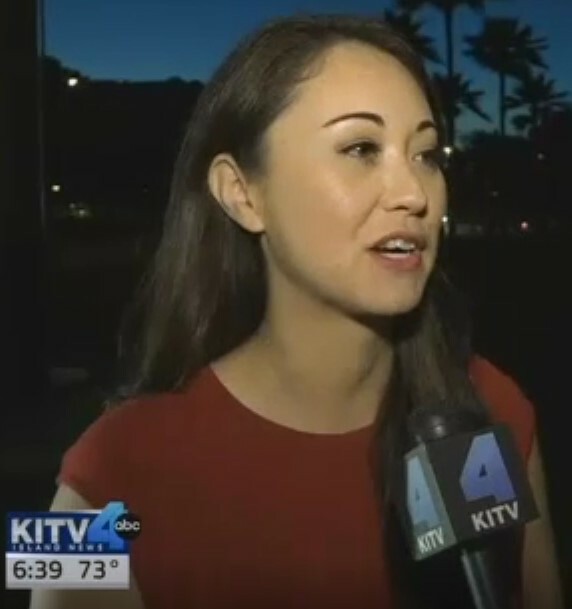 Thanks to Beth Fukumoto, the average person in Hawaii believes that island Republicans are united with Democrats against Donald Trump. And Beth Fukumoto's handlers at the Democrat PR firm were VERY pleased at how their RINO pal performed. Fukumoto drew "major applause" for "her decision to speak up against" Donald Trump. Mission Accomplished, Democrats and RINO's working together.